The Africa Express collective of African and Western musicians will be touring Britain by train this September. ‘The Africa Express’ will be departing London on September 2, taking artists including Amadou & Mariam, Damon Albarn and Rokia Traoré to play gigs in Middlesborough, Glasgow, Manchester, Cardiff and Bristol, before returning to London for a finale concert at the new Granary Square outdoors venue. The train, which features a customised music carriage, will be set up for writing material in-between gigs. As well as the dates below, the collective will be playing pop-up gigs at railway stations, schools, factories and elsewhere. 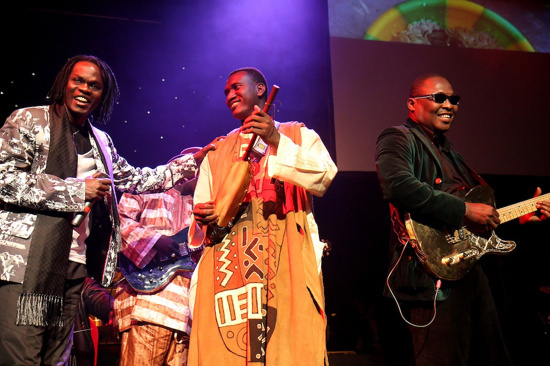 Africa Express started in 2006 with collaborations between artists like Toumani Diabate, Salif Keita, Amadou & Mariam and Baaba Maal (see photograph above) and Fatboy Slim, Martha Wainwright and Jamie T. Since then, the collective have played concerts in London, Glastonbury, Nigeria, the Congo, Ethiopia, France and Spain.